Today, while going through IMDB top 250 movies list, I was surprised... When "The Dark Knight" was released, it hit the #1 spot, after displacing "The Godfather" - which was an achievement, as "The Godfather" was on the top of the list since the list was created (in 1990s). But today, I saw another difference - "The Shawshank Redemption", which used to hold the #3 spot, climbed up to #2 spot - putting "The Godfather" to #3!!! Maybe "The Godfather" days are finally over!!! 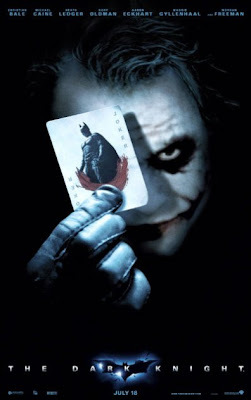 One thing that everyone is discussing about after watching “The Dark Knight” is the Joker. I watched the movie on the first weekend it was released, and was in no mood to review such a movie – a kind of movie which has won the hearts of both the critics and the audience (Batman fan or not). So, what was so special about the movie? Was it the caped crusader himself, or the dark and realistic setting (from Christopher Nolan's previous movie - “Batman Begins”), or the action sequences? Everything was perfect in the movie, but the character of Joker outdid everything (in my opinion). I developed a special interest in this menacing character, and decided to write about him instead. Joker is considered as one of the most dangerous nemesis of Batman. Those of us who have read the comics, seen the television series, or watched the animated cartoons from Warner Brothers would agree. The character was brought into the movies for the first and only time before in the 1989 movie - “Batman”, played by Jack Nicholson. In this movie, a gangster by the name of Jack Napier is disfigured when he falls into a vat of chemicals during a confrontation with Batman, and thus Joker originates. But this character had a history with Batman earlier too. It is shown, in the movie, that the young Jack Napier was one of the thugs who murdered Bruce Wayne's (Batman's real identity) parents when he was young – so he is indirectly responsible for the creation of Batman. The portrayal of Joker by Nicholson was hailed at that time to be one of the best portrayals of the character so far. In the comics, a definitive background for Joker is never established, and his real name has never been confirmed. Every version of comic book comes up with a new story behind the Joker, but all depict him as the same green haired, white faced character, with a permanent smile painted on his face. And his actions – well they are notorious – like a villain always is (either in real world or in comic world). So what is so special about this character that sets him apart from all other adversaries of Batman, making him one of the most memorable criminals Gotham City ever had? Well, he has committed crimes both whimsical and inhumanly brutal, all with a logic and reasoning that, in Batman's words, "make sense to him alone."